Trackingmore supports Thailand Post tracking by entering Thailand Post tracking number. Thailand Post Postal Service provides mailing services including ordinary mail service, EMS service and regular mail service, money transferring service and money saving service. Only parcels shipped via Thailand Post EMS service and regular mail service can be traceable through a Thailand Post tracking number. All Thailand Post tracking numbers start with two letters, end up with two letters "TH" and with nine digits in the middle, so you can recognize them easily. If you just has a tracking number, you can read this post on how to track your packages without knowing the courier. As a whole, the Thailand Post is efficient and reliable. However, there are occasions you packages shipped via Thailand Post can be missing. If your parcels are very important and with high value, you are suggested to use a much more reliable shipping service like DHL. For packages that are not important, you can ship it via Thailand EMS and regular mail service. Do not use ordinary shipping service as you are not enable to track that kind of Thailand Post packages. As Thailand Post official website is sometimes hard to load and enter, and most foreigners may feel hard to understand Thai language, so you can find a better site to track your Thailand Post packages, such as Trackingmore. 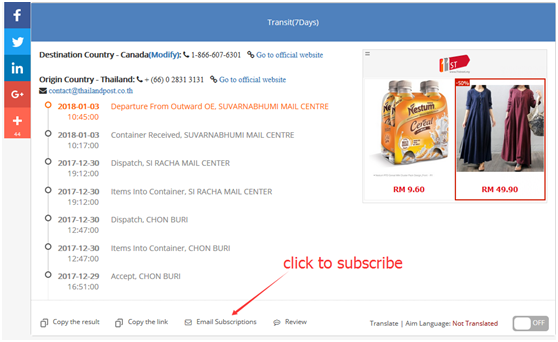 Trackingmore supports you track Thailand parcels in an English interface and receive delivery updates by subscribing its services. I hope all your Thailand Post packages are fully tracked and delivered to the exact delivery address.